We all know the importance of disabling free radicals to insure the health and integrity of our cells; among our many antioxidants for this purpose one in particular stands out – Glutathione (GSH). This is one chemical that you simply cannot live without. Among other vital functions, it is your liver’s main detoxifying tool, and it is your first line of defense against the harm free radicals will do to the interior of your cells if left unchecked. Free radicals (molecules with unpaired electrons in their outer shells) are generated as a biproduct of normal metabolic functions. Cellular respiration itself is a large contributor, and we even deliberately use free radicals as a weapon against invading cells by our immune systems. This shows their great potential for destruction. The unfortunate thing is that this byproduct of energy generation can leak from it’s place in the mitochondria and begin to degrade membranes and other cell components that it comes in contact with. The nutrients Coq10 and lipoic acid can lessen this effect, as can vit E, but the main neutralizer in the cell interior is Glutathione. Unfortunately like everything else our internal production of Glutathione slows down as we grow older, so it becomes critical to consume the substances that lead to its increase. With a little information this is quite easy to do. Another vital use for Glutathione’s anti oxidant ability is the detoxification that occurs in the liver. This complex process occurs in two basic phases. In the first phase, your liver cells secrete what are called cytochrome P-450 enzymes. They deal with the toxins and waste products primarily by oxidizing them, in a process called biotransformation. They are more easily elliminated by the kidneys when in this state. But again we remember that free radicals are toxic themselves, so this is where Glutathione comes in. In phase 2 – called conjugation, your liver uses its abundant Glutathione to reduce and neutralize the free radicals that escape. Toxic heavy metals are also removed in this process, though this is done independent of oxidation steps. Nearly every disease we encounter as humans has also been characterized by a low level of Glutathione. There’s obviously something going on here! Here are the ways you can ensure adequate production of it in your own body. As Glutathione is a tripeptide made up of Cysteine, Glycine and Glutamic acid, these will increase the material necessary for it, and also start the production of it in your body. Have a whey protein shake. Little Miss Muffet had it right, whey is a general “health tonic”, and it has been shown in repeated testing to raise the body’s level of Glutathione. Take Lipoic acid, Vit E, Selenium, Vit B2 and other cofactors for Glutathione production. The Lipoic acid is particularly important because of it’s ability to “recharge” or neutralize Glutathione after it does it’s job (it aids glutathione reductase). 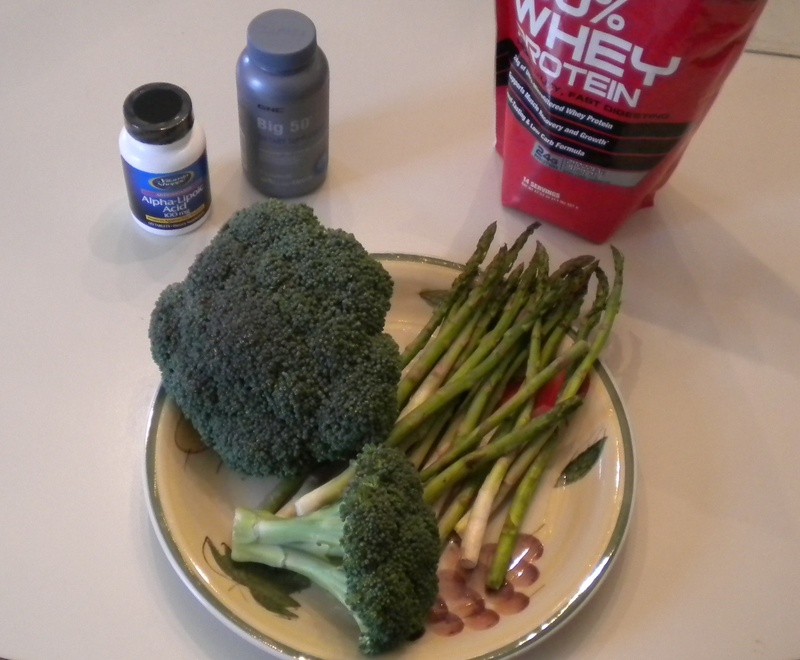 Lipoic acid is a marvelous and fairly inexpensive supplement, among other things it is both water and fat soluble. Consume foods that naturally provide Glutathione: Avocados, asparagus, grapefruit and strawberries. Eat foods that stimulate your body to produce more of it: Chief among these is broccoli, but you should also consume spinach, parsley and the other cruciferous vegetables like cauliflower. Take the precursers of Glutathione: Cysteine (amino acid), N-acetyl-cysteine (NAC), and Methionine. Cysteine and Methionine are two of the three amino acids that provide sulfur; the Methionine is used primarily to convert to cysteine, which is the main limiting factor in how much glutathione you produce. As you can see it is fairly simple to maintain your levels of this crucial substance. These nutrients that increase it are all smart choices for a good diet/supplement plan, and one of the ways you’ll experience their beneficial effects is through that vital substance you cannot do without. So have that first whey shake on me! This entry was posted in Diet, health, immunity and tagged detoxification, diet, disease, glutathione, health, lipoic acid, liver, supplements, vitamin e. Bookmark the permalink.